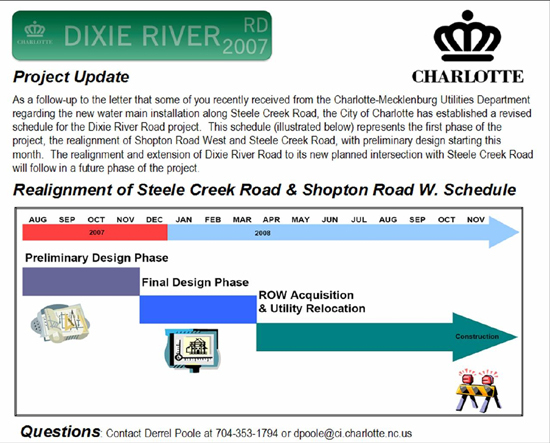 (September 12, 2007) Below is a copy of the project update postcard sent to neighbors regarding the City of Charlotte's Dixie River Road project in the vicinity of Steele Creek Road and Shopton Road West. As the schedule shows, construction of the new Shopton Road West intersection at Steele Creek Road will not begin before December 2008. Construction of the new Dixie River Road is not scheduled. The new Southwest Water main will be installed through this area no sooner that 2009. See The Southwest Water Main Project.